Chemical engineer Richard Konstance and president of Devine Foods, Denise Devine, discuss the nutritional value of the low-sugar, very low-fat shake and ways to improve an develop it into a commercial product. Results are in . . . Adults love the taste of ARS' reduced-sugar, low-fat milk shakes. This shake for the new millennium is a remake of the low-sugar shake developed in the 1970s for USDA's school lunch program by retired researcher Virginia Holsinger, formerly with ARS' Dairy Products Research Unit in Wyndmoor, Pennsylvania. The new shakes have less than half the sugar and about 10 percent of the fat of commercial shakes. The concept of a low-sugar, low-fat shake was probably ahead of its time two decades ago. Now, however, since the introduction of low-fat cheese into the school lunch program and a push toward more nutritionally balanced meals, the shake's time may have finally come—in schools and elsewhere. Last fall, ARS opened its doors to about 600 youngsters for a taste-testing of the chocolate shakes, which are more like soft-serve ice cream. Kids, with their "choosy" culinary tastes, weren't crazy about the shakes. Some comments: "Not sweet enough," "There's an aftertaste," and "Tastes like cereal." "We're trying to reformulate the shakes and get rid of the cereal flavor," says Richard Konstance, a chemical engineer in the dairy unit. Konstance is working with cooperative research and development agreement partner Devine Foods, Inc., of Philadelphia, Pennsylvania, to change the shakes and further develop them as a commercial product. "Our goal is to provide a dessert that contains the same nutrients as an 8-ounce glass of chocolate milk. But it's easier to provide cartons of milk than milk shakes," Konstance says. "It's more labor intensive to provide shakes because schools need a milk shake machine or soft-serve machine and someone to operate it," says Konstance. "A hard-pack version of the shake would be easier for schools to deal with, but there's a difference in formulating soft-serve and hardened ice cream." "Ultimately, we want to create a product for young children that is healthful and great tasting," says Denise Devine, president of Devine Foods. After getting kids' opinions, ARS took the shakes for another test drive—this time with adults, ages 22 to 52. The adults loved them! They thought they were just sweet enough and tasted better than many other dietary shakes. What's more, the shakes are good for you. They are based on ARS technology and contain Devine's patented composition, which reduces fat and calorie content and adds fiber and nutrients. The fiber content is about 2 to 2.2 percent, which qualifies the shakes as a good source of fiber. A 10-ounce shake has as much calcium, vitamins, and minerals as a serving of milk and has fewer calories. One more benefit: The shakes are significantly lower in lactose—good news for those who are lactose intolerant. "These nutritious shakes should be available to consumers in the near future," says Konstance.—By Tara Weaver-Missick, Agricultural Research Service Information Staff. 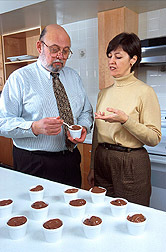 This research is part of New Uses, Quality, and Marketability of Plant and Animal Products, an ARS National Program (#306) described on the World Wide Web at http://www.nps.ars.usda.gov/programs/cppvs.htm. Richard P. Konstance is in the USDA-ARS Dairy Products Research Unit, Eastern Regional Research Center, 600 E. Mermaid Lane, Wyndmoor, PA 19038; phone (215) 233-6600, fax (215) 233-6795. "Shaking Up the Future" was published in the May 2000 issue of Agricultural Research magazine.